The historic Chesuncook Lake House was destroyed by fire early Saturday morning. CHESUNCOOK TOWNSHIP — A historic inn in northern Maine built more than 150 years ago burned to the ground early Saturday morning. The Chesuncook Lake House was built in 1864 for supplying logging operations. Fifty miles north of Moosehead Lake, the lake house was listed on the Federal Historic Register. Maine Forest Rangers and Greenville firefighters responded to the scene by snowmobile. In a Facebook post, the owners said all family members and employees escaped unharmed. “We have suffered a tragedy overnight and the lake house had been claimed by fire,” the post reads. Hundreds of comments have been posted on the lake house Facebook page expressing sadness and support for the owners. 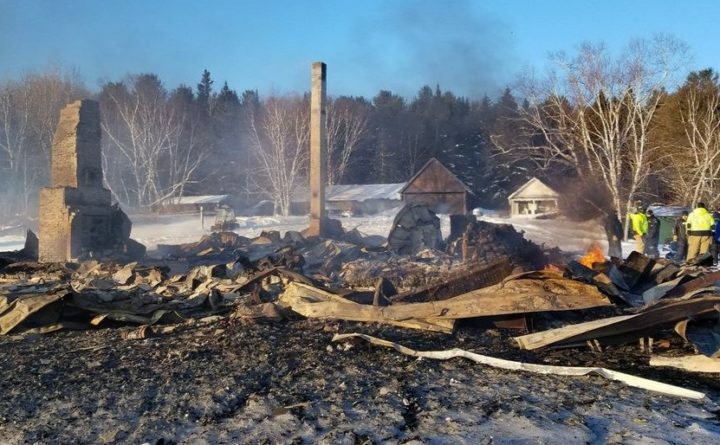 “While we share in the owner’s sadness over this loss, we are thankful that no one was hurt and no other structures were damaged,” a Maine Forest Rangers Facebook post reads. According to its website, the Chesuncook Lake House overlooks Mt. Katahdin and has been featured in magazines throughout New England and beyond.